I don't know about you, but I'm always looking for a good deal. Earlier today, ASK announced the launch of Ask Deals, its proprietary database of more than 1 million high-quality savings offers from national and local merchants across hundreds of product categories. Kind of an interesting concept. Basically Ask Deals scours the Web for all the deals available online - from cheap Halloween costumes to restaurant coupons - and organizes the best money-saving offers front and center on the results page, eliminating the need for consumers to search multiple coupon sites or search engine links to find their answer. The service is powered by Ask.com's proprietary Deal Detector™ technology. I tried a few search including one for "Las Vegas" and was presented with some cool results. The Web's best deals - in one place: Ask Deals aggregates more than 1 million high-quality savings offers on the Web for hundreds of product categories and rolls them into one, easy-to-read display. Easy-to-find deals, front and center: Ask.com saves users time by blending deals into the search results page, making them easy to find via "Smart Answers" with yellow savings arrows at the top of the page, as well as green money-saving icons within the search results. Money-saving related searches. 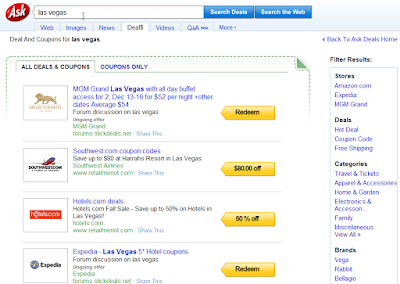 Consumers can easily find additional great discounts by clicking on "money saving searches," built with Ask.com's award-winning Zoom Related Search™, which appears at the top of the right side of the search results page. Easy sharing. Consumers can share coupons and deals with friends and family through email and popular social networking sites like Facebook, Twitter and Digg. I love th ability to print coupons... very cool feature. Deal of the Day. We really liked this feature, when consumers choose an Ask Deals homepage skin, they'll get daily "can't miss" savings offers, chosen by the Ask Deals editorial team, streamed right onto their Ask.com homepage. Users can also sign-up for "Deal of the Day" emails to receive new and timely deals every day.